Police stop demonstrators during a protest against the students of Jawaharlal Nehru University (JNU) outside the university campus in New Delhi, on 15 February, 2016. The University’s Students’ Union President Kanhaiya Kumar was remanded to judicial custody for 14 days after being charged under India’s 156-year-old, colonial-era sedition law. India’s 156-year-old, colonial-era sedition law–used against arrested Jawaharlal Nehru University Students’ Union President Kanhaiya Kumar–has been discarded by the UK (where punishment once included chopping ears), Scotland, South Korea and Indonesia. Read more from our special coverage on "JNU ROW"
Among the countries that hold on to sedition as a criminal act: Saudi Arabia, Malaysia, Iran, Uzbekistan, Sudan, Senegal and Turkey, as this report pointed out. The US also has a sedition law, promulgated 218 years ago but with many parts struck down over two centuries. Germany keeps a sedition law on its books largely because of post-Nazi sensitivities. Kumar was remanded to judicial custody for 14 days–amid violence within and outside a Delhi court room–after being booked for sedition under section 124A of the Indian Penal Code (IPC), which does not actually use the word “sedition”. “It is only found as a marginal note to Section 124A, and is not an operative part of the section but merely provides the name by which the crime defined in the section will be known,” according to this paper. As many as 47 sedition cases were reported in 2014 across nine Indian states, according to this National Crime Records Bureau (NCRB) report. 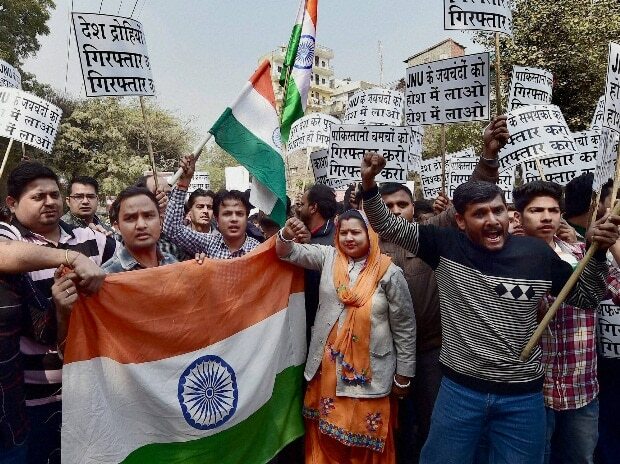 In recent years, those arrested on sedition charges include a cartoonist, students cheering Pakistan in a cricket match, a Gujarati caste-group leader, and a Kerala man for a Facebook post. Most of those charged were not violent or had not incited violence, a legal pre-requisite for a sedition charge. “Sedition in India is not unconstitutional, it remains an offence only if the words, spoken or written, are accompanied by disorder and violence and/ or incitement to disorder and violence,” Fali Nariman, constitutional jurist and Supreme Court advocate, wrote in the The Indian Express. “When a person is dubbed “anti-Indian”, it is distasteful to India’s citizenry, but then to be “anti-Indian” is not a criminal offence, and it is definitely not “sedition”. (It only means that you are a freak, and that it is high time to have your head examined! ),” Nariman wrote. Yet, sedition was widely used by Indian state governments in 2014. Jharkhand reported the most cases (18), followed by Bihar (16), Kerala (5), Odisha (2) and West Bengal (2). Jharkhand and Bihar accounted for 72% of the total sedition cases in 2014. Bihar topped with 28 arrests, followed by Jharkhand (18), Kerala (4), and Odisha (4). As many as 58 people–55 men and three women–were arrested for sedition. The NCRB included data on ‘Offences Against the State’ for the first time in 2014. ‘Offences Against the State’ have been classified largely under two categories: Offences against state (under sections 121, 121A, 122, 123 & 124A IPC) and offences promoting enmity between different groups (under sections 153A & 153 B IPC). Others, with 129 cases, accounted for 73% of the total cases under Offences against state. In all, 512 offences against the state were reported in 2014, of which 176 were ‘offences against state’ and 336 were offences promoting enmity between different groups. About 872 people were arrested–865 males and seven females–under these crimes. Note: Offences against state (sections 121, 121A, 122, 123 & 124A IPC) and offences promoting enmity between different groups (sections 153A & 153B IPC). As many as 323 cases were reported under section 153A of the IPC for promoting enmity between different groups on ground of religion, race, place of birth, etc. Section 153B IPC, which covers imputation and assertions prejudicial to national integration, saw 13 cases. Kerala topped with 72 cases of Offences Against the State. Assam (56) was second, followed by Karnataka (46), Rajasthan (39) and Maharashtra (34). Maharashtra reported the most arrests—204–for Offences Against the State, followed by Kerala (98), Meghalaya (67), Karnataka (63), and West Bengal (59). These top five states account for 56% of the total arrests across India. The United Kingdom abolished the sedition law in 2009. Britain’s Law Commission had recommended the abolition of the law in 1977. “Abolishing these offences will allow the UK to take a lead in challenging similar laws in other countries, where they are used to suppress free speech,” Claire Ward, Britain’s former Parliamentary Under Secretary of State at the Ministry of Justice, said while abolishing the law. Scotland followed in 2010. South Korea did away with its sedition laws during legal and democratic reforms in 1988. In 2007, Indonesia declared sedition as “unconstitutional”, saying it had been derived from its colonial Dutch masters. In contrast, in October 2015, the Malaysian federal court dismissed a challenge to its colonial-era sedition law–with the same origin as India’s–often used to quell political opposition. Saudi Arabia executed Shiite cleric and political dissident Sheikh Nimr al-Nimr for sedition in January this year. 121 – Waging, or attempting to wage war, or abetting waging of war against the Government of India. 121A – Conspiracy to commit offences punishable by section 121. 122 – Collecting arms, etc., with intention of waging war against the Government of India. 123 – Concealing with intent to facilitate design to wage war.